This was another first for a golf society, arranging a weekend getaway for our regular Saturday players. For this trip, we selected a short golfing weekend at Kabinburi, which is just over 2 hours drive away from Pattaya, with two rounds to be played at the fabulous Kabinburi course. 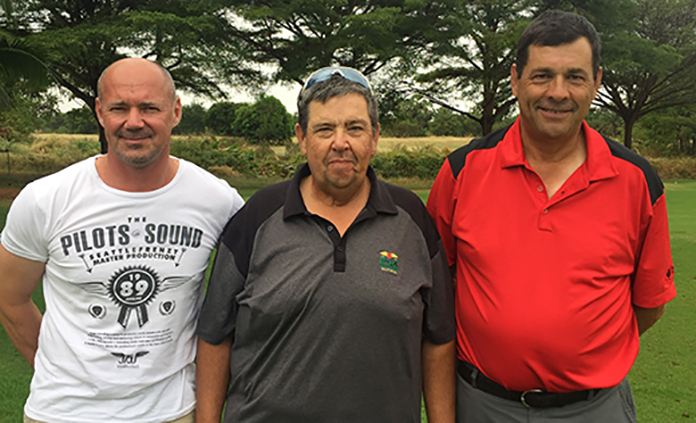 (Left to right) Andre Coetzee, Maurice Copan and Greg Jones. On arrival everyone was pleased with the Kantary hotel, which is a gem in Thailand with friendly staff. The Kabinburi Golf Course was surprisingly quiet for a weekend and we were able to play leisurely golf without much in the way of hold ups. Maurice Copan raked in 4 birdies and a single bogey for amazing back-nine of 33 gross (27 points on 9 holes! ), which made him the overnight leader with a fabulous 41 points, followed by Greg Jones with 36 points. There was plenty of good golf, with KB (Jin Lee) almost scoring a hole in one and Greg Jones also missing an ‘ace’ by literally an inch. On the thirteenth hole (par 4), Andre Coetzee hit his drive within 5 feet of the pin but sadly missed the short eagle putt. 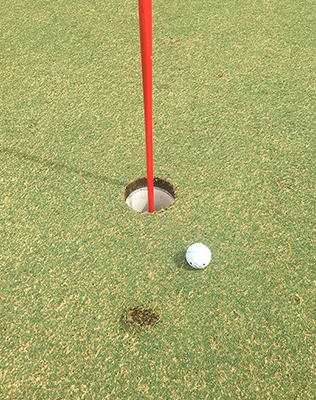 Greg Jones can’t get much closer to a hole in one. Young Aaron Douglas Handford was playing in a separate group from his dad (Sugar Ray Handford) on day 2, which seemed to have done him well. Having a particularly good long game for his age (outdriving his dad most of the times), he also had a much better short game on day two with plenty of good putts. With a bit of short game practice and a better suited putter, it won’t take this young man long before his handicap is in the teens, and he comfortably won day 2 with a great 38 points. 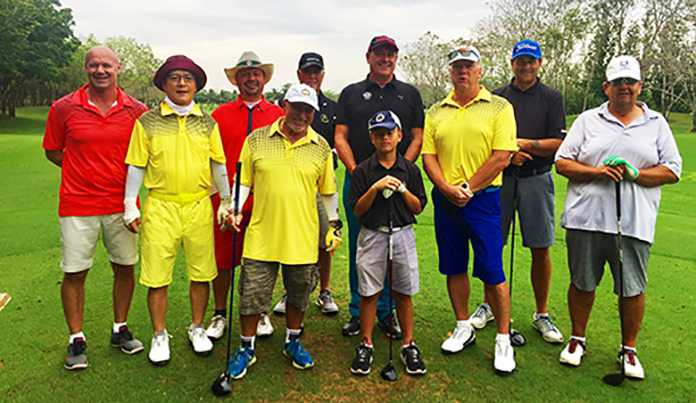 Outback golfers strike a pose at Kabinburi Golf Club. Maurice’s game became unstuck on day 2, but his good result from day 1 helped him to finish in 3rd place overall. With two half decent rounds of 32 and 33 points, Andre Coetzee managed to finish 2nd overall, however, no one beat the consistency of Greg Jones who’s overall 69 was enough to win him top spot.